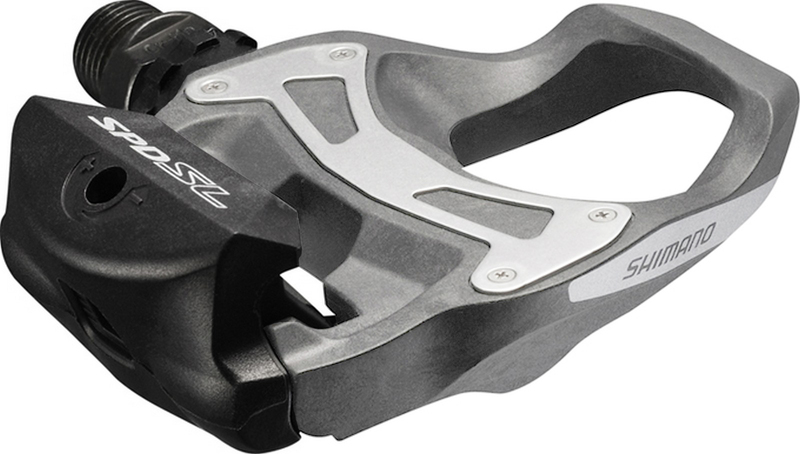 Shimano PD-R550 SPD-SL Resin Composite Road Pedals including cleats. Always well made and good value for money. No need for more expensive carbon pedals, these will do the job just fine. Lots of adjustments and easy to tweak. Stable and strong. Really good pedals at a very nice price. Would recommend to everyone. Awesome pedals, very sturdy and easy to clip in and out. Great pedals for the non-racing minded. Easy to clip in and out. Perfect fit and easy snap-off when removed. A big difference from my first road pedals which really hurts my feet during unclipping. They look like the 105 or Ultegra,. The difference is in its weight and materials. It's a really good option if you're on a budget. Coming from using double sided SPD's these are taking some getting used to but I am slowly mastering the knack. Only done about 60 miles so far but all good. My first pedals, but so far very good. This was an excellent bundle with road shoes. Still using about the lightest setting on the tension and no problems! Haven't got much to compare with, but easy to mount and easy to get in and out of. After 2 years and 15000km it still works perfect. Very good price to quality factor. Amazing pedals, function no different to my dura ace version. Makes you wonder if you really need to spend the extra cash!! Got this with the 105 groupset and got a nice discount because of that. This pedals have a steel plate and are a little more heavier but I guess that this will make them last longer. They feel more tough! Excellent value, simple to set up and use. Not as good as Ultegra (as expected) but much better than the clunky metal bodied R450's and at the recent sale price an absolute bargain. Easy to clip in/out and a decent, comfortable wide footbed. Recommended. Very nice pedals at a good price. Pedals are sturdy, reasonably light, run smooth, and look elegant. Clipping in is snappy and confident. The cleats are more walkable than other designs I've had over the years, without the need for cleat covers and such. Excellent quality pedals. Solid contact surface smooth bearings. Easy clip in and off. Very satisfied with this purchase. Perfect NO-nonsense pedals. Pre-lubricated, ready to install. First time clip user, and no issues whatsoever. Perfect service and delivery from merlin. Reliable and bullet proof pedals, I've used these on other bikes in all weathers and they need zero maintenance no matter how wet or dusty they get. Pedals have a good firm grip and will not disengage the cleats accidentally. High quality pedals. The tension adjustment is easy to change. They look really good and Merlin had the best price I could find for SPD-SL pedals. Not much else to say. Took about a week and a half to get to the US, which is really good for $8 shipping. Thanks Merlin! It's really hard to see why anyone would pay 4 times the price for the Dura-Ace version of these - these are plenty light enough and do a great job. Fantastic pedals. If you are not a pro, this is more than you need for a good ride. Good pedals, my second pair. Great pedals. Can't tell the difference between these and a set of ultegra 6700 pedals. Not sure you can beat the price/performance ratio. Had two weekend 100k rides with those. So far, perform as expected. Excellent product. Excellent service. These are great pedals, and all you need. I've got Dura Ace pedals on my good bike and bought these for my training and TT bike. Once you are on the bike you cant tell the difference between these and the Dura Aces. The DAs are a bit lighter, but thats the only benefit and not worth the extra cost. I've won 4 crit races with these, including bunch sprints, so they are plenty secure enough. Great pedal for the price. Good to see the steel wear plate, should be a improvement over the PD-R 540's plastic. Great pedals at a great price. Easy to set up in fact no adjustment needed straight out of the box. Good firm cleating in and nice broad platform. Love these pedals. I have been using look for years but wanted a wider pedal to help with numbness in the feet. Works great, very easy to clip in and out and the wider platform feels like it provides better power transfer to me. Much improved over my previous 105s. The best thing for me is that I find plastic body much easier to engage, especially in the wet. Incredible service. Ordered late Friday; arrived Saturday morning!!!!! Nice looking pedal, wider, more comfortable and lighter than the old R540 replaced. Supplied with cleats. Fantastic value and super speedy delivery from Merlin. Slightly heavier than I expected but barely more than my old alloy ultegras. I was particularly chuffed that they came with an extra set of cleats as mine were wearing a bit low. Great product, easy to install, easy to get in and out of, previously used normal push pedals, these are a good upgrade for entry level cyclist. Very well constructed, solid pedal, Very comfortable. I bought the Shimano PD-R550 SPD-LS Road Pedals, along with Shimano R088 SPD-SL Shoes and they are great. This is my first clip in shoes and pedals and they are fantastic. As ever superb service from Merlin. Thanks guys. Fantastic lightweight pedals, ideal for the beginner. Easily adjustable and comes with cleats included. Changed from Shimano 105 (5600) SPD-SL pedals and have to say that these pedals are definitely equal in quality to the my previous model. The wider pedal contact surface is noticeable and adds a more solid feel. No problem getting enough spring cleat retention force either which is something that I thought might occur as these pedals are described as entry level. The only down side is that the resin body doesn't look quite as nice as the alloy body of the 105 (5600) SPD-SL pedal. Great price and quick delivery from Merlin Cycles. First pair of road pedals, so I don't have a lot to go on, but they seem good to me. Easy to fit, as you'd expect (they have spanner flats and a hex socket on the end of the axle). Definitely a more solid platform than mtb pedals that I am used to and no problem clipping in and out with the tension adjustment screws. Only issue is that whereas with mtb pedals, you can clip in on either side, with these you can only clip in on one side. I assumed the pedals would be 'bottom heavy' so they always presented themselves the right way up, but this doesn't seem to be the case, so getting the pedals upright can be a bit of a pain. This might become easier once the axles bed in a bit; not sure. Not sure if this is the case with all road pedals or not. These are great value, look the same as the more expensive carbon in the resin (black) same cleat size and operating mechanism. Unless you want carbon weight saving, look no further for a great effective and well made pedal. Works faultlessly and loads of tension adjustment. These pedals are so much lighter than my previous R540's and more comfortable due to the wider platform. Merlin were quick to deliver with great communications. Thank You !!! Great pedals at a great price, unless you are a tour quality rider you really don't need anything else.